What's the appropriate age to start logging onto social networking sites? According to the Terms of Service for Facebook, at least, the answer is 13. But that doesn't stop thousands of younger children from signing up. According to Facebook's chief privacy adviser Mozelle Thompson, Facebook removes about 20,000 users a day who are underage. Should parents allow their under-13 kids to sign up on Facebook? That figure was revealed during testimony to the Australian parliament's cyber-safety committee, reports The Daily Telegraph. Australia is considering legislation that would require teens to get parental permission before joining Facebook. As it stands, Facebook policy simply recommends that minors 13 or older get their parents' permission. Those younger than 13 are forbidden outright. But as Thompson testified: "There are people who lie. There are people who are under 13 [accessing Facebook]." That age cut-off isn't arbitrary. It keeps Facebook in line with COPPA, the Children’s Online Privacy Protection Act, which requires that Internet sites that allow those under 13 to join secure parental permission. But as a recent New York Times article quipped, "the fake ID has gone digital, and spread to elementary school." That story suggests that the 20,000 youngsters booted from Facebook daily are really just the tip of the iceberg, citing research from the web analysis company Comscore, that over 3.6 million of Facebook's 153 million monthly visitors from the U.S. are under age. There are social networking sites aimed specifically at this age group. Togetherville, which was recently acquired by Disney, is designed for children under 10. Disney also operates Club Penguin which targets those 6-14. Togetherville stresses the importance of teaching children about safety online by introducing them to a social networking site where their parents can monitor their interactions and control who they "friend." The idea addresses concerns about younger children and teens on Facebook -- fears that they'll be preyed upon or they'll misbehave. But will kids be interested in Togetherville or Club Penguin when their friends and family are on Facebook? 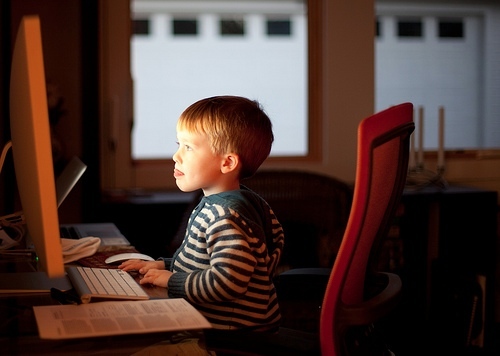 Should parents be complicit in signing up their under-13 kids on Facebook? Some feel strongly that parents should set the right example for digital citizenship by following set rules and guidelines, and those who feel that allowing kids to navigate the social networking world will provide valuable lessons through practice. We'd love to hear thoughts from parents and educators about their approach.